A garden pond, or a water garden as it is often called, adds enormous appeal to a garden. It can be large or small, simple or dramatic. It can include waterfalls, fountains, elaborate rockwork, and special lighting, or it can be serenely empty. It can be a natural pond with a flowing spring or a plastic tub. Choose your garden pond while considering the size of your property, the amount of maintenance you wish to do, your budget, and the style of your garden. Many homeowners make a garden pond using prefabricated parts from a garden center or home improvement store. Others are more free-form in their design. The container for your pond can be a commercial preformed tub designed for the purpose, a freeform hole dug and lined by the maker, or even an old bathtub! For a small pond, a capacity of about 20 gallons is a practical size. Water weighs about eight pounds per gallon, so if your pond is elevated, be sure the supports can hold that much weight. Black, charcoal, and dark green colors are good choices, since they give an impression of greater depth and discourage algae growth. Placing the pond is very important. As with a fountain, consider what location will give you the greatest pleasure. Remember that children and pets love standing water, so consider their safety as well. Placing the pond in an open area will reduce the time you spend clearing fallen leaves and other debris out of the water. Sunlight is very important. Most aquatic plants need six to eight hours of direct sunlight daily to grow well. If you want your aquatic plants to be healthy, filling the container with clean water is essential. Don't use water that has been altered by a water softener. City water is normally treated with chlorine and may contain other additives as well. Let the water sit in the tub for at least 24 hours before adding plants, so that the chlorine can evaporate. If your community uses chloramine, a more stable form of chlorine, you will need to use a commercial product to decontaminate the water. A water garden is a miniature ecosystem that must be in balance to remain healthy. 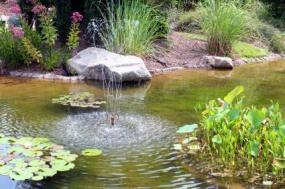 Typically, it takes three or four weeks for a new garden pond to establish a healthy balance. About two weeks after it is set up, the water normally turns cloudy with algae. A week or so later, the aquatic plants will get the algae under control by absorbing sunlight and nutrients that contribute to algae growth. Then the water will clear. It will remain clear as long as the ecosystem is in balance. Plants grown in artificial garden ponds are rooted in individual pots, which are placed in the water-filled pond container. You can use a soil mixture specially made for water gardening or just a very heavy clay garden soil as a potting medium. Topping the pot with half an inch of pea gravel helps to keep the soil in place. Many aquatic plants have very specific preferences for the depth of water they prefer. You can put bricks beneath the pots to bring the plant to its preferred depth. 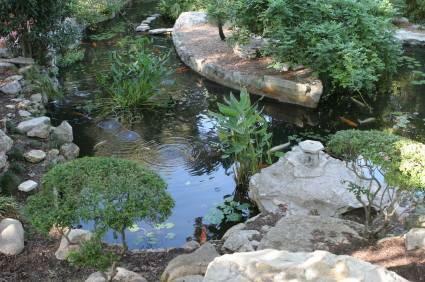 For maximum health of your pond, only about half the water surface should be covered with plants. Aquatic plants are usually divided into three categories: floating, emergent or marginal, and submerged. Both floating and submerged plants are needed for a healthy pond ecosystem. A balanced ecosystem will have few problems with algae growth. Most problems are caused by overfeeding fish, over fertilizing plants, or having too few plants available to take up the nutrients in the pond. Reducing available nutrients is the best way to eliminate algae problems. The most obvious method is to reduce the fish food and fertilizer added to the pond. It may be necessary to flush the pond and add fresh water. Adding more aquatic plants, until about 50 per cent of the water surface is covered, is also useful. Larger ponds may require a pump and filter system. A common algae problem that pond owners face is the dreaded string algae. It begins to appear once the sun is brightly shining on your pond. Especially in the spring before the plants have begun to spring up after their winter dormant period. String algae actally battles with your aquatic plants for nutrients that are floating in the pond. At this point your balanced ecosystem becomes messed up with mounds of stringy algae that is quickly taking over. You may need help to elimate it if you cannot take care of it on your own. The most balanced ecosystems may need help sometimes. You may need a supplement that breaks down organic materials that are creating problems around waterfalls, rocks, planted pots and filtration systems. You may turn to products like Aquascapes Designs ECO-BLAST. 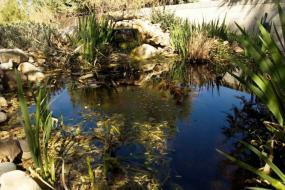 It can help to spot treat the most troubled areas of your pond. You can follow up with their product S.A.B. for a full attack on string algae. These products do not contain chemicals, which make them safe for your pond life. If you don't go this route you may prefer to get in the pond and weed the string algae out by hand or with a toilet brush taped on a long broom handle. One other method to think of as an algae control method is barley. Barley straw placed in the pond water decomposes which then releases a chemical. Barley breakdown combined with water and sunlight begins to form a certain peroxide which breaks down the cell walls of the algae. Barley pellets may be purchased to be used inside most filters and skimmer systems. You may even set them along the inside of the pond using a mesh bag for easy application. If you begin to get that dreaded green water during the hot summer months, beneficial bacteria can save the pond. Beneficial bacteria added according to the directions on the bottle is an important thing to do to maintain clear and healthy balanced pond water. You may try products like Aquascape Designs AquaClearer to supply the good bacteria to the pond. Both the liquid and dry forms are chemical free and 100% all-natural. Use chemical applications only as a last resort, since many can injure plants and animals. Follow directions very carefully and employ proper safety precautions. It is essential to not go overboard when treating your pond. Contact your local water garden supplier if you need guidance. Let nature take care of your pond's health when you can. An established pond (a few years old) usually needs less care than a brand new one, as the natural, balanced ecosystem has now taken over the perfect care of your beautiful pond. Unless you live in a subtropical or tropical climate, plants in a small garden pond will have to be moved indoors for the winter. Plants can be moved while still in their pots to water-filled tubs placed in a cool, dark basement. The plants will go dormant for the winter and revive when they are placed back in the garden the following spring. Floaters can be over-wintered in aquariums under bright light.